This Is One Legendary Superbird Drag Race! Must See! - Muscle Cars Zone! This Is One Legendary Superbird Drag Race! Must See! If you`re into drag racing, you`ve probably heard the names Ronnie Sox and Buddy Martin. They were a dynamic duo, famous in the drag racing world for being almost unbeatable. This was back when Richard Petty was the number one stock car racer who set a record of 100 wins that I don`t think anyone will beat in the near future. However, these people never went one against the other, so it was time for that to happen – they line up and do this legendary Superbird drag race to see who can come out on top after a quarter mile of distance. However, this race wasn`t much of a race at all – it was a proverbial slaughter. The drag-prepped Superbird that Ronnie Sox was in, took the lead immediately after leaving the starting line and extended that lead to over one second by the time he had reached the finish line a quarter mile further. 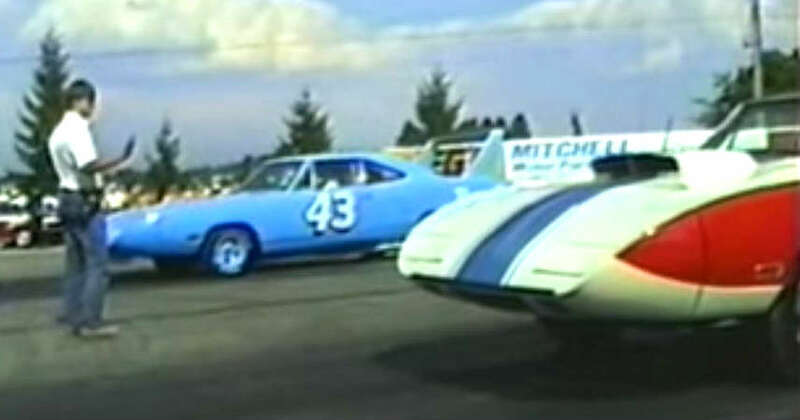 This doesn`t diminish Richard Petty`s record but it does show that prepped and unprepped cars are vastly different and there can be no comparison between the two – if you make your car specifically for drag racing, much like Sox in this incredible Superbird drag race, you are going to win versus the same car without any modifications. Finally, take a look at the most legendary race cars of all time!